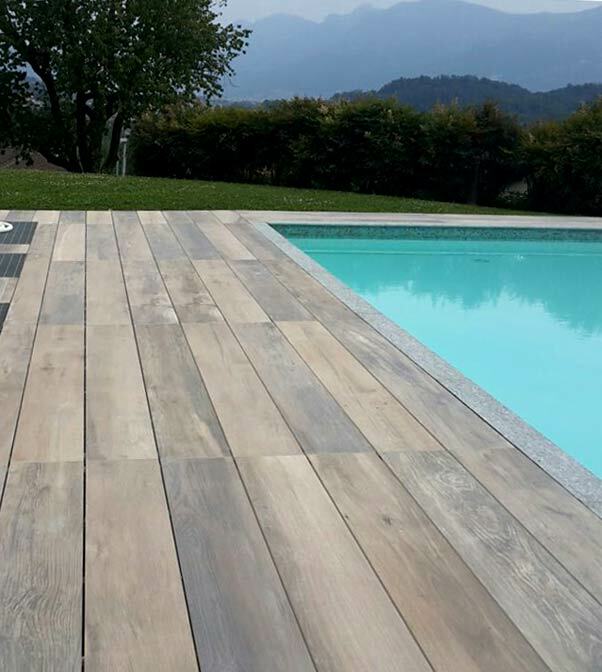 Build elevated decks with a traditional long wood plank look but without the worries of fire regulations, ongoing maintenance and poor stain resistance by using DeckWay wood look porcelain pavers – the ideal alternative when building elevated decks on rooftos and terraces. 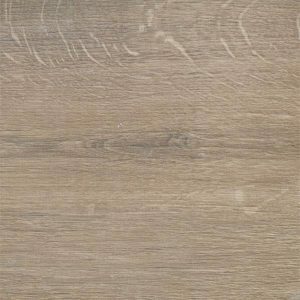 DeckWay porcelain planks are designed to look like natural wood, but avoid all the problems of natural wood decking. 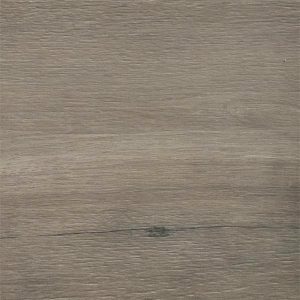 The 8’ long x 12” wide solid 3/4″ thick porcelain planks won’t burn, change color over time, twist, warp, rot, splinter or need regular maintenance to keep them looking good year after year. Since porcelain is essentially non-porous, the pavers won’t stain, develop mold or mildew or retain water for long periods. This exceptional elevated decking system, now available exclusively from Archatrak, enables elevated decks to be built with less structural components, no special tools, no highly skilled manpower and and can typically be installed in much less time than building a conventional solid wood deck. The DeckWay system is essentially a simple structure of 94″ x 12″ porcelain planks laid over a grid of 8′ long hollow steel beams. The beams are laid overy Eterno ‘Maxi’ adjustable height deck supports which are spaced at 24” intervals across the deck area. The purpose of the steel grid assembly is to reduce the number of pedestals required to support the planks and to provide a firm, strong and stable support structure for the deck. By using a pedestal system, the deck can be made perfectly level, irrespective of whether the substrate is sloping or uneven. The 8’ long planks are laid over the steel beams with each plank sitting on rubber faced support heads which are slid onto the beams. Spacer tabs keep the planks at a precise distance from each other. No other fixing devices are required as the weight of the planks (approx. 67lb) is sufficient to prevents any movement of the planks. Why Use DeckWay for Building Elevated Decks? The DeckWay system enables you to build an elevated deck that captures the elegance and classic beauty of a traditional wood plank deck wherever a natural wood look is desired, but fire resistance, low maintenance, high durability and low maintenance are also essential requirements. 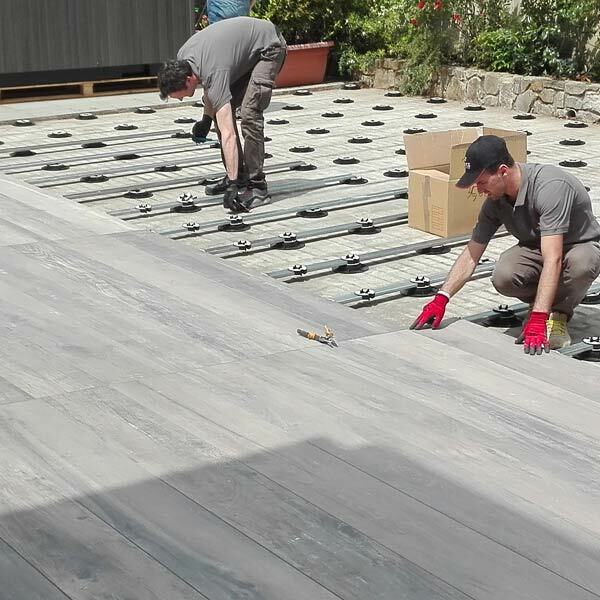 It’s the ideal wood alternative for rooftop decks and terraces as well as other elevated paving and landscaping applications. DeckWay is available in three color options. DeckWay is supplied as a set of modular components – 94” x 12” (nom.) porcelain planks, 94 ½” long hollow, galvanized steel beams, Eterno ‘Maxi’ adjustable height pedestals and pedestal head caps. 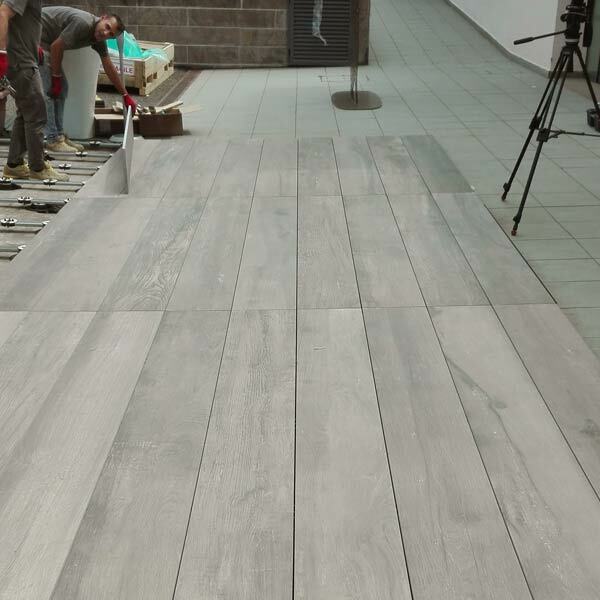 Hollow steel tubing is supplied precut to 94 ½” – the precise width of 8 porcelain planks. The only place where steel beams may have to be cut on site are at the outside edge of the deck. The following should be used as a guide for calculating quantities of each component required, based on the proposed deck area. 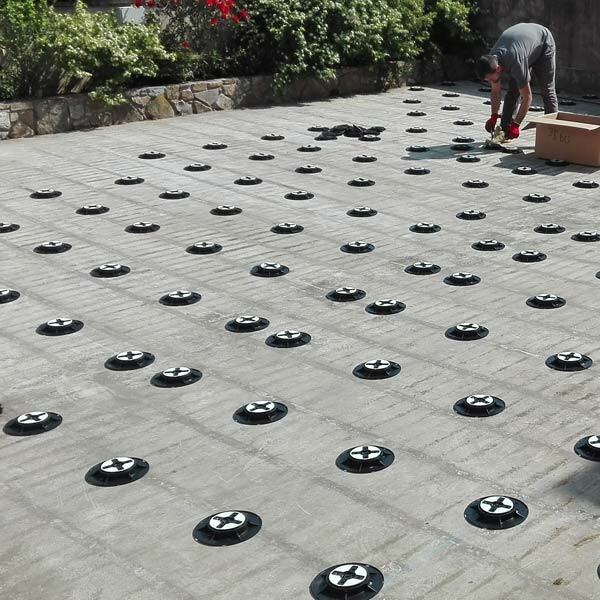 The surface on which the deck is to be laid should be solid, clean and sloping slightly for drainage. There should be a solid perimeter containment such as a parapet wall, which will prevent the deck surface from moving. Firstly, mark out horizontal lines 24” apart over the area to be laid using chalk. Then mark the approx. position that the Eterno ‘Maxi’ pedestals will be placed along these lines, also at 24” spacing, to form a grid. Pedestals at the edge of the deck area should be placed as close to the retaining wall as possible. 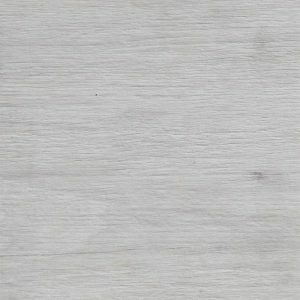 Calculate how many porcelain planks will be needed to span the area and ensure that no plank at either side of the deck will need to be cut to less than 4” in width. Position the pedestals in the location you have previously marked with chalk, selecting the appropriate height pedestal for the location. The hollow steel beams are then placed over the pedestal heads and pedestal caps clipped over the beams, with the end of each beam centered on a pedestal head. Check for level as each beam is installed. When all beams are installed, check again for level, and make any small adjustments as necessary by screwing the pedestals up or down to ensure a level deck surface. Once the beams are level, lay the porcelain planks over the steel beams resting on the rubber head of the pedestal caps. Pedestal caps are slid along the steel beams to accurately position the porcelain planks. Spacer tabs ensure accurate spacing and the tabs can be easily snapped off where not required. Lay the complete deck in a likewise manner, making sure the ends of each plank are positioned on the center of a pedestal head.